The story of FIRO Theory begins in the era when Humanistic Psychology [also known as The Human Potential Movement] was emerging as the dominant force in human development. Prior to this, traditional psychologies were based on the ‘deficit’ approach, they began with the assumption that something was wrong with or ‘missing’ from the person seeking help. Will Schutz, who created FIRO Theory, was re-called into the US Navy during the Korean War. Already an eminent scientist, he asked if the Navy might use his skills in some way. He was commissioned to study and discover what it is that makes teams compatible. He was given free reign to do this and as a result he recapitulated the history and evolution of modern group therapy, from group dynamics research through ‘T’ groups to an eclectic form that eventually became know by the name he gave it ‘Open Encounter’. He published FIRO Theory in 1958 along with his famous FIRO-B® psychometric instrument. FIRO is an acronym for Fundamental Interpersonal Relations Orientation. It is based on a dynamic psychology of growth and development which asserts that all behaviour is derived from three dimensions: inclusion, control, and affection (subsequently in later revisions Schutz changed this dimension to openness). The FIRO-B is an instrument used to measure and predict the characteristic preferences/orientation of an individual in each of the three dimensions and uniquely to measure what the individual ‘wants’ in their interactions with others. Schutz continued to develop and refine FIRO Theory for the rest of his life. Along the way he published nine books all of which described FIRO from slightly different perspectives. Three of these are still in print, the original, ‘FIRO — A Three Dimensional Theory of Interpersonal Behaviour’, ‘Profound Simplicity’ and ‘The Human Element’ (all of which are available from Learning Edge). I once asked him which of his books he felt best described FIRO Theory, he replied without hesitation ‘Profound Simplicity’. FIRO Theory goes much deeper than looking at just our behaviour. It postulates that our behaviours around inclusion, control and openness are driven by our beliefs and feelings about ourselves, which in turn are linked to our sense of significance, competence and likeability in our interpersonal interactions. These beliefs are driven in turn by our ‘self concept’ that is how we see and experience ourselves and manifests in how we behave towards our self in terms of aliveness — how we include ourselves; self-determination — control, how we manage and structure our lives and relationships; and the degree to which we like ourselves — openness, self affection. The feelings component of the self concept is defined by the degree to which we perceive ourselves to be self-significant, self-competent and the degree to which we like ourselves — self-likeability. “All Behaviour Is Driven By Self Esteem”. When our self concept is positive and healthy, life tends to be much easier, we exhibit flexibility and resilience in our interpersonal relationships. When our self concept is negative we will tend to become defensive very easily, this makes life tough. 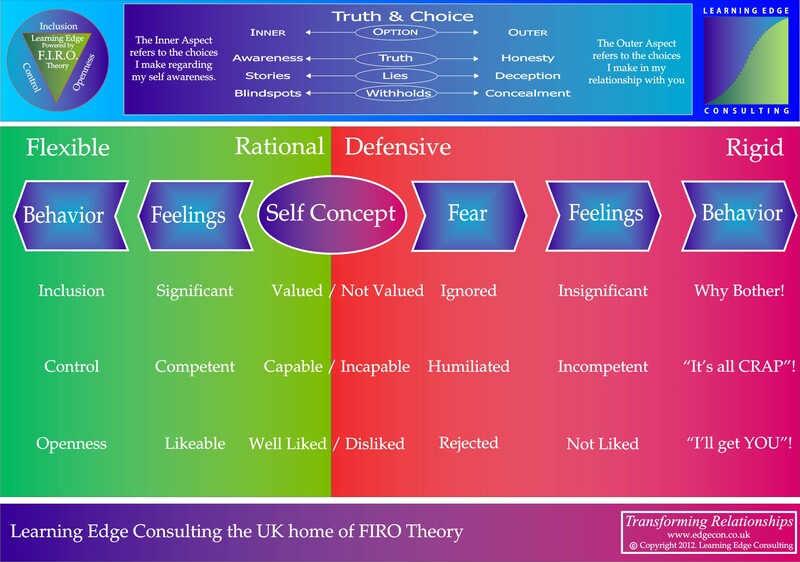 Defensive reactions will typically lead to either under-behaviour or over-behaviour in one or more of the dimensions, the graphic at the foot of this page illustrates this. For example persons who have inner conflicts about their significance, their value, their importance, can easily become defensive when not included in meetings and gatherings, or when feeling that they are being ignored socially. If the inner conflicts revolve around their ability to manage their life and or their work, if the conflict is about their ability and competence, they might become defensive when challenged. This may also manifest if they have too little guidance, or if they are micro-managed. They will fear looking stupid. Inner conflicts regarding ones likeability, ones innate self worth, could create defensive reactions when personal you – me issues are addressed. People who are conflicted around their own likeabilty, their fundamental self worth, may appear cold and aloof as a defence against rejection, or they may behave in an ‘over the top manner’ in an attempt to ‘get’ others to like them. There are three fundamental, interwoven principles at the heart of FIRO Theory, these are: Truth—Choice—Awareness. Truth is about our relationship with the truth. That which is true. Being true to our self. “Keep Telling The Truth” is one of the most powerful of all FIRO Techniques! Choice is about recognising that we determine our own lives, however challenging this may at first appear. Awareness is a sense of consciousness of our own being. Being true to our self involves acknowledging our own truths and the fact that we are self determining, autonomous human beings. Awareness is about openly and honestly acknowledging ourselves, how we feel, what we want and don’t want. Choice is about accepting responsibility for our life. It is not about self-blame! When Schutz invites us to “Keep Telling The Truth” he is simply providing us with the means of personal liberation through self determination. “Truth is the grand simplifier” [Schutz]. Self responsibility and self accountability lead to self determination and empowerment. All Learning Edge Consulting programmes and training workshops are based on FIRO Theory.